Late spring time was always my favorite time in Colorado mountains. Snow makes off-trail travel low-impact and possible where otherwise restricted, like Rocky Mountain National Park or Indian Peak Wilderness. It can also make cross-country travel easier as walking on hard-packed snow usually beats traversing fields of talus and scree. Most importantly, it is like an icing on a cake - I just appreciate the visual aspect of it. Some ten years passed since my last trip in Colorado, and I wanted to recall memories of those trips by having a similar adventure here in California. 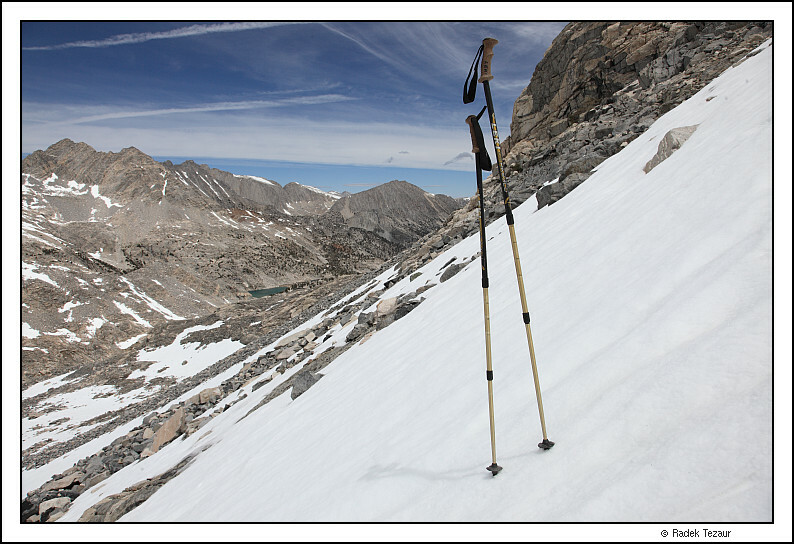 After a record dry winter, snow was scarce in mid June in the California Sierra mountains. I chose the Mosquito Flat Trailhead (10,300ft) because it gives easy access to a high elevation terrain around it. 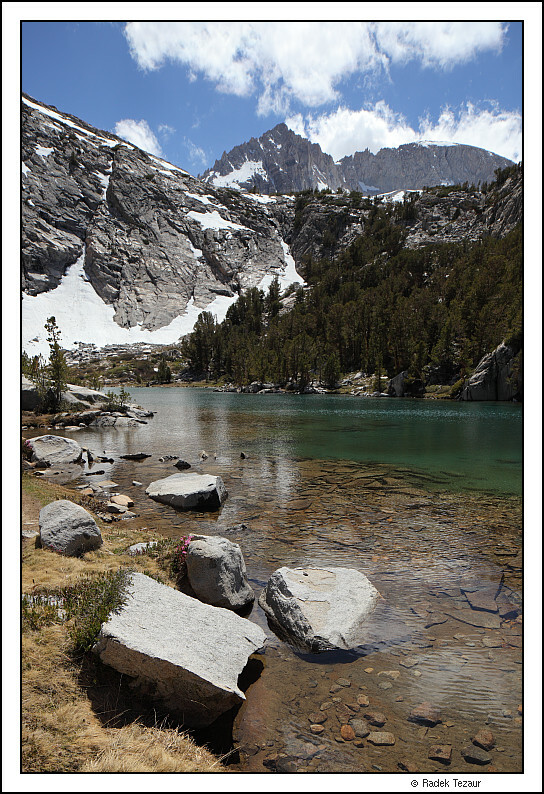 The area requires backcountry permits for overnight trips and I booked a spot in the area of Gem Lakes that is accessed from the Little Lakes Trail. I was going to take some late snow season photographs and if conditions were right, pick up a nicely shapely peak, Pyramid Peak, 12,866ft. After a long drive from the Bay Area to Tom's place, I drove up on Rock Creek Road to the trailhead. It was after 2 p.m. and most people were coming back from a day hike when I finally hit the trail. The weather was beautiful and a panorama of the peaks at the end of the Little Lakes Valley, including Bear Creek Spire, Mt. Dade, Mt. Abbot and Mt. Mills, opened up less than a mile from the trailhead. The peaks still carried enough snow, but the lake dotted valley itself was free of it, a stark difference from the first time I visited four years earlier on a fourth of July weekend. I passed a few other backpackers heading in the same direction. I got closer to the high peaks as I passed Heart Lake, Box Lake and Long Lake. It was cloudy when I finally arrived at the upper Gem Lake and found a nice camping spot between the trees. I noticed quite a few disregarded the rules, camped right next to the lake and made campfires. The sun peaked through the clouds at sunset and cast some color on the ridges of Little Lakes Peak above me. 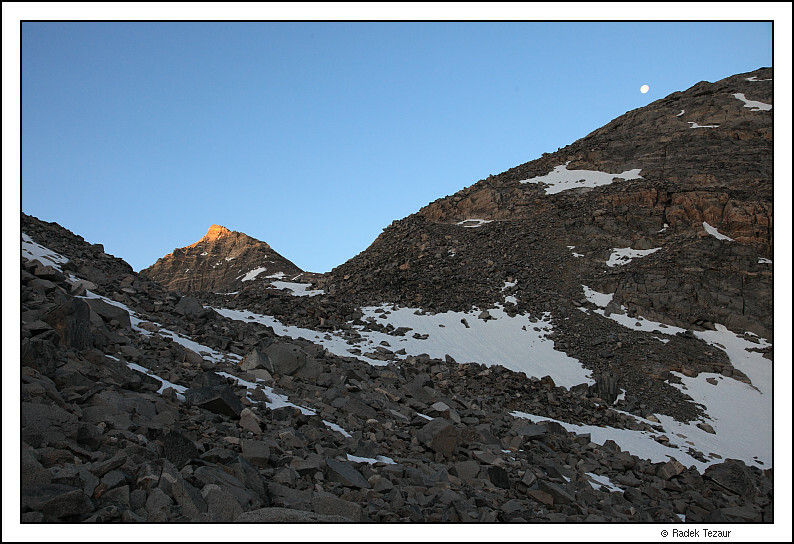 Snowfields that descended all the way to the lake level made for a chilly evening which was no surprise - I camped at an elevation just short of 11,000 ft. I woke up before 5am. The clouds cleared overnight and as I made my way up from the lake, I watched alpenglow and the first sunrays illuminate the surrounding peaks. 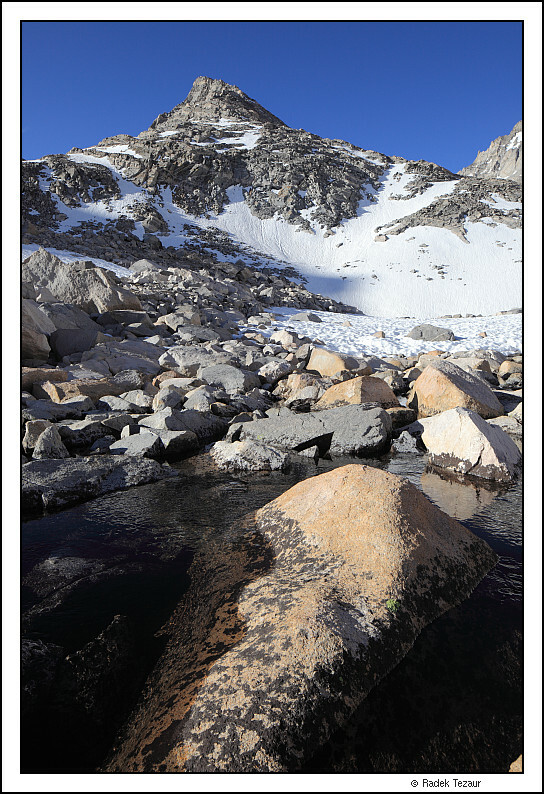 I passed an unnamed lake above Gem Lakes below the east slopes of Pyramid Peak. It was not frozen over anymore which somehow did not make sense in the freezing morning wind. I paused several times to take in the scenery and watch the moon set over Pipsqueak Spire. 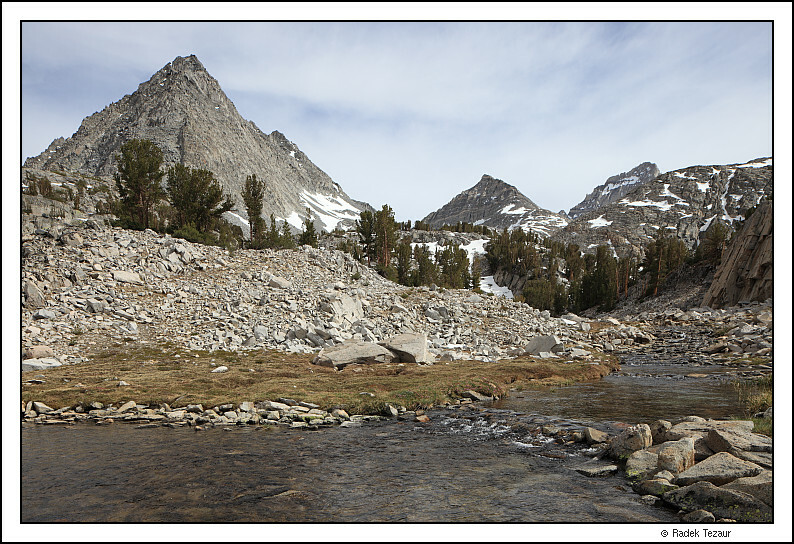 I continued toward Dade Lake, passing another unnamed lake which was frozen over, and met a couple of mountain climbers heading up Bear Creek Spire. For a second, I was jealous of their light gear, but I lumbered on with my tripod, heavy camera, and lenses - only my tilt-shift could really do justice to Mt. Dade from my perspective. 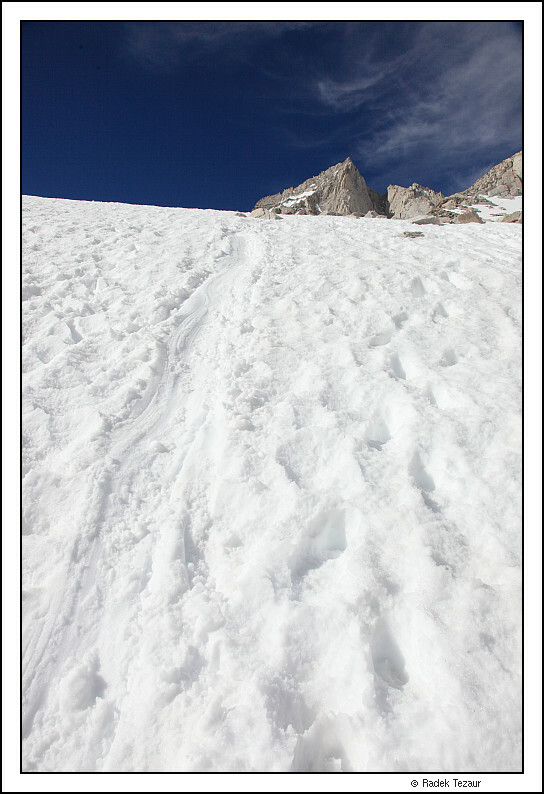 I climbed up the northwest face, initially on an icy snowfield that gradually steepened to 35 degrees. Ill-equipped with just trekking poles for this type of a climb, I was happy to leave the snow as soon as possible when the length and vertical drop of a possible slide became ominous. I continued up ledges and loose boulders toward the peak. The rocks moved with almost every step, giving me a pause. It was a relief when I finally reached more stable rock near the summit. From there, I enjoyed the view down the southern face and Spire Lake below it. 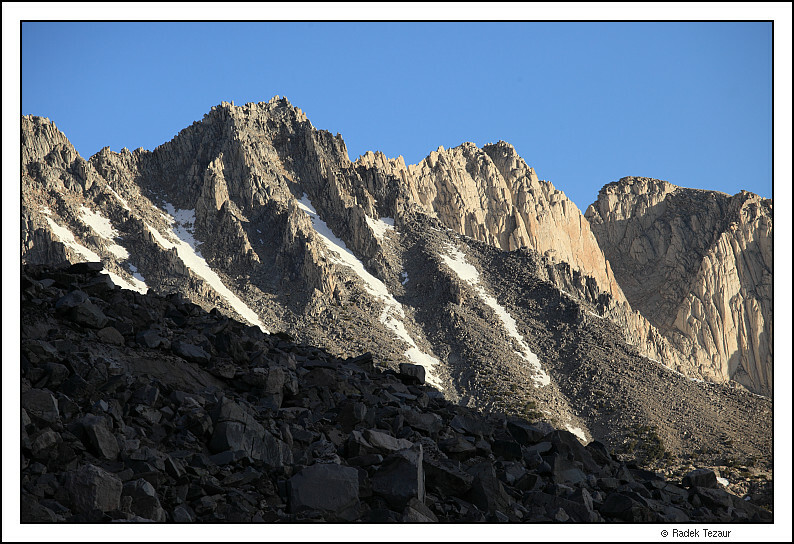 Bear Creek Spire loomed large to the west. Great views extended in all directions. The summit register showed the last climb for eight months earlier in November and that is how I left it. I followed the same route on the way down. The snow softened up some and it felt like June, which it was, when I got back to my camp. I hanged around the lake a bit to take a few more pictures before packing up and heading back toward the trailhead. Even though a bit lighter that the day before, my backpack felt heavy on the way out Maybe it was just hard to leave the mountains behind.